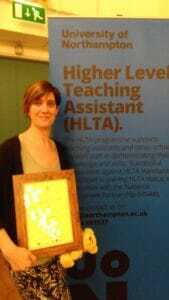 The school nominated Mrs Lightfoot for the HLTA of the year award 2018 (East Midlands region). The judging panel met and shortlisted Mrs Lightfoot as a finalist! There were many applications from the East Midlands and to be shortlisted as a finalist was an amazing achievement. She was invited, together with Mrs Thompson, Miss Davidson and Mr Dalton, to attend the University of Northampton’s annual regional HLTA Celebration Event on 21st June where the winner was announced. At this event, Mrs Lightfoot’s many achievements were shared and she was awarded with a framed finalist certificate and teddy bear. Although she did not win, we know that the true winner is St. Andrew’s for having such fantastic members of staff like Mrs Lightfoot.